Peace and Love were a wish, a yearning and ultimately a steadfast, albeit passive movement to battle an era that was actually massively full of strife, uncertainty, and social injustice. 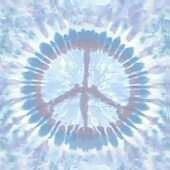 The Hippie generation of the '60's fought and succeeded in raising awareness, changing locked mental attitudes, and tearing down a lot of damaging and prejudicial issues with our (collectively) weird and eccentric Hippie ways, "love-ins" and protests. Especially important was the impact that musical expression had during that generation, expressing, through the words of of the songs, both the need for love and peace as well as dissatisfaction with the 'shape of things'! I think the music of the 60's is just as popular these days as it was then, and the lyrics serve as a reminder that they were the voice of change. Today, any color people have more opportunities and a hell-yea say-so, and we're not looking at the sky with fear waiting to be nuked, just to name a couple among many changes. There's a new set of issues and battles these days...that never ends in the arena of this existence, yet what is disheartening is the indifference that is prevalent today, unlike the zeal we had along with the Hippie-Flower Child image. We must never forget the special people that fought for us in the 60's who were not Hippies, did not wear their hair long nor participate in Love-Ins and protests, but gave their blood, sweat and tears, and many of them their lives...too many! On August 18, I posted a line on Facebook which read "If it was 1969 Woodstock would be wrapping it up." meaning it was the last night of the event. My friend Bob replied with the following: "Your right but I was in V-nam (Vietnam war) with hundreds of thousand of other young men who could not go, and many of these young men never return home, so this is what I remember of Woodstock".